This box is beautiful. I bought it for my husband and he loves it too. Plenty of room for large faced watches and nicely made. Very manly. I would purchase again. Showcase your fine watch collection with this watch and accessory jewelry box by Bey Berk. Offering display space for up to ten watches, this jewelry box makes it easy to organize your items by style, color or brand. Each storage compartment features a unique design to preserve the shape of the watch bands. 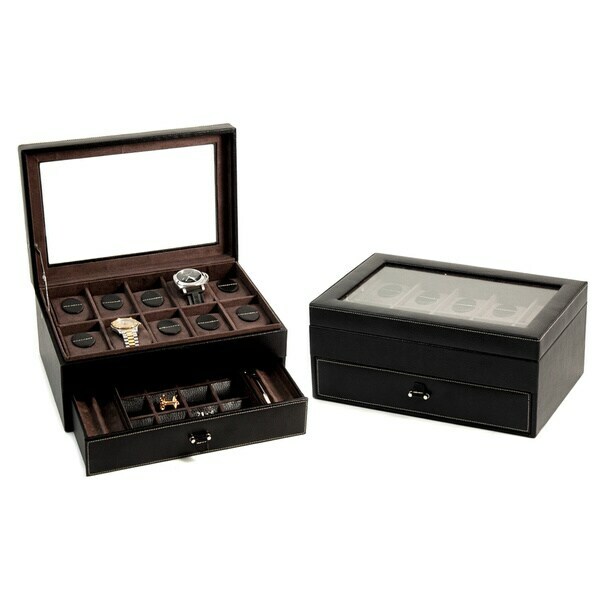 A pull-out drawer includes additional compartments for rings, cuff links and extra watch straps. Featuring a glass top, this jewelry box lets you view your items while protecting them from dust and debris. Velour lining prevents scratches and damage to gold and other soft-metal jewelry, and a hinged lid provides effortless access to the items stored within. This was a Christmas gift for my husband. He has a collection of watches and needed a place to put them. This was the perfect gift for him! All of his watches fit perfectly!! He was happy, and I was happy that his watches weren't taking over our closet. Lol!! But seriously, I'm ordering one for myself to put my watches, bracelets, earrings, and rings since there are slots for cufflinks in this watch case as well. This accessory box had more varied storage compartments than others I considered. Great looking and well made. The leather is beautiful, and the box is very well made. The glass top is elegant and considering how beautiful *his* watches are, it is a nice touch to see them without having to open up the box. . Lots of room for other accessories that a man collects and looks very much in place in his bedroom. Excellent for a nice watch collection. It also provides enough space to organize smaller items and avoid loosing them. It fits cuff-links, tie bars, etc. Great for a gentleman's items. My husband collects watches and fountain pens and this box was exactly what he's been craving. It looks lovely and holds quite a few watches. The little drawer is perfect for his pens and basic jewelry. Very happy. The leather was a very nice touch. The watch / bracelet holders help keep the shape and display very nice. The extra drawer is perfect for rings and cuff links. My husband loved it! He displays it in his closet without feeling like there's a feminine touch creeping in. Great value as well. I purchased this jewelry box for my husband. He absolutely loves it! It's great quality and looks very nice. This is a very nice watch box. My husband loved this gift. Holds all my watches and Jewelry. Nice Product. Got this as a gift for my husband and he was very pleased. It is stylish and sized just right for his watches. It's also easy to travel with instead of bringing multiple watches in boxes he uses this one case. I bought this for my boyfriend for Christmas and he loved it. He liked it so much he wanted one for his son. It is beautiful and great quality. Was looking for the perfect birthday present and found it! My husband will never admit to being a watch collector, however, if he has 1, he has 50! I had been looking forever and found nothing....until..I checked OVERSTOCK. My #1 GO-TO! Was thrilled by the size and clear top which allows you not to have to tear everything out to find what you're looking for. Also looks nice on his dresser. Bought for my son-in-law and he loved it! perfect for the beginner watch collector. Holds 12 watches. Beautiful box. 16 squares in middle and 4 long spaces , front to back - 2 on each side. "Is their room in the bottom compartment to hold glasses?" Hello AJ, it's possible that a pair of glasses may fit in one of the side compartments in the bottom, depending on how thick they are. Thanks for shopping with us! "Hi, Can we put the large face watches in it? thanks"
Hello PS, we are still researching this and should have the answer shortly. Hello PS, thank you for your inquiry. Unfortunately, the information you have requested is currently unavailable. You will receive an email notification once an answer is posted. Have a great day.